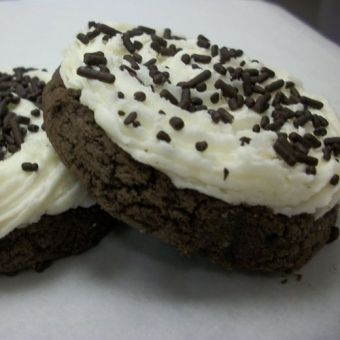 Our KoKo cookie line is a dark chocolate shortbread cookie topped with our dark chocolate ganache frosting or our famous vanilla buttercream icing. Our Koko Kream is a combination of chocolate and vanilla flavors all in one decadent bite. Sit down and enjoy with a tall glass of milk. Size: -- SELECT -- Koko Kream Sprinkle 10 ct.Koko Kream Sprinkle 20 ct.Koko Kream Sprinkle 30 ct.Koko Kream Sprinkle 60 ct.Koko Kream Sprinkle 90 ct.